The Life Intentional: Three Weeks! The countdown is here. In less than three weeks, I'll be back in the US. I almost can't believe that it's happening! I'm excited that I'll get to go to my grandpa's 87th birthday party in Arizona, bum around my hometown in Colorado (and see people, of course), and visit people in Tulsa before heading to Arkansas. I do hope the driving part won't be too bad. I'm flying from Arizona to Colorado, but I'll be driving from Colorado to Tulsa. I haven't driven in over a year and I'm going to be driving fourteen hours in one go! Oh well, coffee will be my friend. I am going to miss Hong Kong. I've been trying to a lot of things before I leave, like drinking lots of milk tea and going shopping in Mong Kok, stuff like that. Today I'm going to get an egg tart! It'll be a bit strange to transition from the bustle of the big city back to a small town again, but it'll be nice. I look forward to small things I miss like farmer's markets and frisbee in the park and getting pupusas and snow. It'll be an interesting chapter, however long it may be. Pray that I get a job when I get back! And I'll be seeing some of you very soon, on the other side. Can't imagine you have been in HK for about a year already. You are one of the best friends I met in Hong Kong~ Although we've only spent 6 months, we had fun in Swing, bible studies, shopping, eating etc. They were all fond memories of our friendship. You also live your life sharing the love of God. I am thanking God for meeting you. Enjoy the city life in HK and will stay in touch even if you are back to the State. 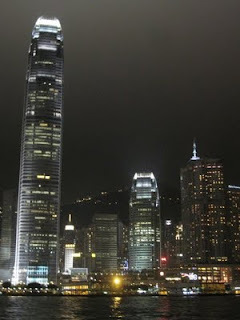 By the way, You have captured the beautiful night view of Hong Kong. Haha, no problem. Now you know!